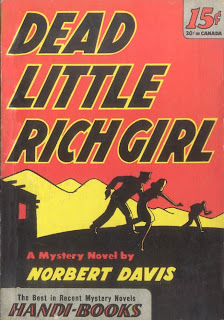 Some time in 2013, I discovered American writer Norbert Davis through his book Holocaust House Though published in 1940, the book has nothing to do with what the Nazis were doing at that particular period, it is instead a delightful read featuring a pair called Doan and Carstairs. 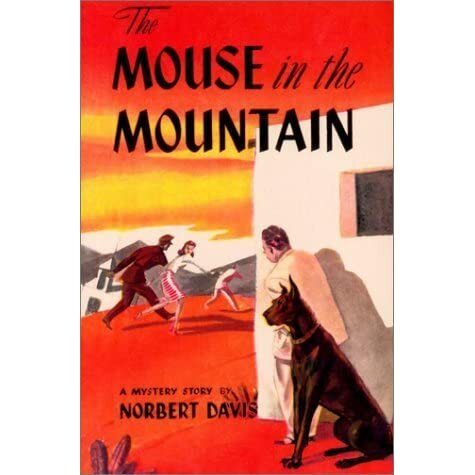 While reading about Davies at that time, I came to know that the next novel in the series :The Mouse in the Mountain was considered to be one of the most humorous novels ever written. It immediately went on my wishlist. But somehow or the other, never quite got round to reading it and it was only when it was announced @Past Offences that February was to be dedicated to 1943 that I decided to reacquaint myself with the pair again. "... Patricia Van Osdel. She's the flypaper queen. Her old man invented stickum that flies like the taste of, and he made fifty billion dollars out of it"
Although advised not to do so, the touring-party makes its way to a remote village Los Altos. Though they are not telling, almost all of them have a special reason for wanting to visit the village. Unknown to them, the Mexican millitary too has special interest in the village. Almost before they have set foot in the village, a man is shot dead by one of the touring party. This brings the uber nationalist Lieutenant Perona on the scene and even before they know it, there is an earthquake, a murder, an attempted murder... and there is just no stopping after that. IN LOS ALTOS, THERE HAD BEEN A RUMOR GOING THE rounds that some rich tourists from the United States who were staying at the Hotel Azteca outside Mazalar were going to make the bus trip up to Los Altos. It was obvious, of course, that this rumor wasn't entirely to be trusted. Anyone with any brains or a radio knew that the people from the United States were too busy raising hell up and down the world to have any time to look at scenery except through a bombsight. Captain Perona breathed hard. "I will forgive you--this time, senorita. Mocking people and ridiculing them is, I understand, a custom in your detestable country." "My what?" Janet said, stung. "The United States. I have heard that its people are very ignorant and uncouth." "Especially the women. They have loud, shrill voices, and they shout in public." "They do not!" Janet cried. Captain Perona smiled at her blandly. Several passersby turned to look curiously at her. She began to blush, and she put her hand up to her lips. "You see?" asked Captain Perona. "Even you do it. Shouting in public is considered very unmannerly in Mexico." "My mother told me so. My family did not realize they had been robbed by this Ruggles criminal until she told them. But she knows. She knows everything about people from the United States because she came from there herself." "You mean, your mother is an American?" Captain Perona looked at her. "That is a very disgusting habit your countrymen have. Calling themselves Americans as though they were the only ones. I will have you know that Mexicans are Americans. We are more Americans than people from the United States are, because we came to America before they did." As the world turns more insular and narrow-minded would such a book be allowed today? I am certain that if India was at war and such a book was to be published the poor author would be bombarded with the most vituperative abuses and hounded out of his home. Children of Mother India would cry hoarse at how India's culture (and especially Indian womanhood) had been degraded and how the author was an anti-nationalist, a blot on India....so on and so forth . More than anything else it made me admire the US' (I will not call it America's lest Lt. Perona come breathing fire at me) spirit of free-thinking and the ability to laugh-at-one-self. But I wonder if the same spirit pervades the US of today? Opening Lines: WHEN DOAN AND CARSTAIRS CAME down the wide stairway and walked across the pink-tiled floor that was the pride and joy of the Hotel Azteca, the guests in the lobby stopped whatever they were doing to pass the time away and stared open-mouthed. Doan was not such-a-much, but Carstairs usually had this effect on people, and he left a whispering, wondering wake behind him as he stalked across to the glassed side doors and waited with haughty dignity while Doan opened one of the doors. He ambled through it ahead of Doan into the incredibly bright sunlight on the terrace. I love that comment about using the term "Americans" for people from the US. I always thought that was strange and inaccurate (and I live here). I have several of these books (unread) and I think it was your earlier reviews that inspired me to get them. I will have to get to this soon. I enjoyed all the satirical digs at US and Mexico alike, Tracy. I really wish you'd read the books. I found this to be better than the first one. This does sound terrific, Neeru, and I'm glad you enjoyed it. And you know, I've never liked that term 'Americans,' either. Like Tracy, I live in the US, and don't use it. Margot, then how do you refer to yourself? Because for us, the people from the sub-continent, US is Amrika and its citizens, Amrikans. "But I wonder if the same spirit pervades the US of today?" It most certainly does. I can tell you that I am embarrassed by anyone who behaves like the typical uncouth American when I'm travelling outside of the country -- even when travelling in my own country. We never say we're from America, BTW. We always say we're from the US. Sometimes we pretend we're from Canada! If you'd like to read a more contemporary satirical view of how an American writer feels about this cartoon version of a US citizen try TOURIST SEASON by Carl Hiassen. Wickedly funny with a very black sense of humor. His early books are very angry in how he writes about what happened to his home state of Florida. I liked this book a lot. Hope you can find SALLY'S IN THE ALLEY so you can read more of Carstairs and Doan. I have an extra copy if you'd like it. Just email me and I can mail the package to Canada as I did once before. John, you are very generous. Many thanks but Sally's in the Alley is also available for free download @ManyBooks. I am glad you too like this book. Thanks for recommending Tourist Season. It is there at Open Library and I'll be borrowing it soon. I am very glad to know that the spirit of free thinking still prevails in the US. In India, somehow or the other, critical thinking is not encouraged to the extent that it should be. You are not the only one, I too am embarrassed (sometimes downright ashamed) by how my countrymen (and women) behave at times. Always nice when you visit the blog and comment.